Ford has announced that the on-demand Chariot operation will cease operations on Friday 25 January, with all operations in the USA being wound up by March. 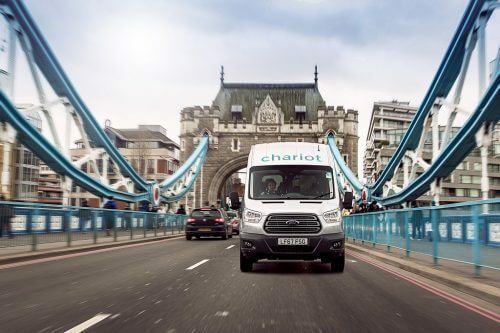 Ford has announced that it is to close down operation of all Chariot on-demand services in the coming weeks, with the London operation’s last day of service being Friday 25 January. Chariot was acquired by Ford for £51m in 2016, two years after the operation began in San Francisco. It has gone on to operate in a further nine American cities, but fierce competition from other on-demand providers such as Uber has meant that these operations have struggled with passenger numbers. The London operation operates three routes named after the areas that they serve. These are the Nuxley Navigator, Shooters Hill Shot and the Wandsworth Wanderer. Chariot had also been building its private business shuttle services, with two operating in the Stockley Park area. The Chariot service in London utilises 15-seater (including driver) Transit minibuses with 2.2ltr Euro VI diesel engines, some of which have rear wheelchair lifts fitted. The cost of using one of the London routes is £2.40 per ride or there is an option to purchase a weekly pass at £20 per week. Commenting on the closure of Chariot on a blog post, Chariot’s CEO Dan Grossman said: “In today’s mobility landscape, the wants and needs of customers and cities are changing rapidly. We apologise for the inconvenience this may cause Chariot’s riders and our enterprise customers.